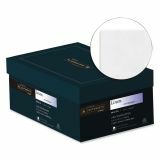 Southworth 25% Cotton #10 Envelope, 4 1/8 x 9 1/2, White, 24lb, Linen, 250/Box - No. 10 envelopes capture the rich texture and feel of natural linen. 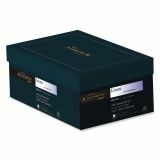 Richly textured, 25 percent cotton fiber is ideal for use with letterheads, reports and presentations where a distinctive look is a must. 24 lb. envelopes are watermarked, acid-free, and compatible with laser and inkjet printers. Envelopes are made with a high percentage of recycled material.